Nearly two-thirds of the U.S. population is at risk of being subjected to random "citizen checkpoints" because they live within 100 miles of a U.S. border. Washington, D.C. – The Trump administration’s immigration crackdown has brought increased attention to the little known “Constitution-Free Zone” that extends 100 miles inland around the entirety of the United States. While the practice of Border Patrol employing “citizen checkpoints” within this zone is not a new practice, it has drawn increased scrutiny from civil libertarians and they’re increasingly popping up. Most people would be surprised to know that far away from the border between the U.S. and Mexico, on highways in Maine, New Hampshire, and numerous other states, U.S. Customs and Border Protection checkpoints are stopping vehicles without any reasonable suspicion and asking them if they are legal U.S. citizens. 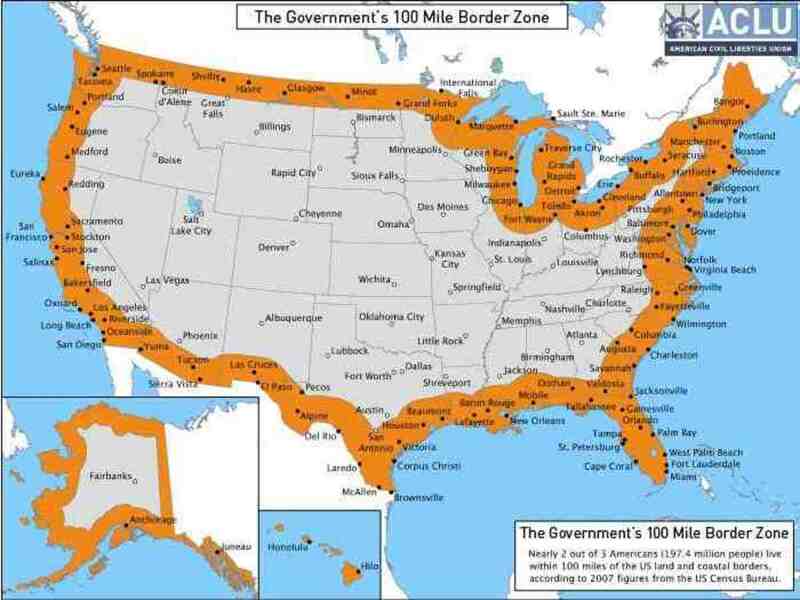 Incredibly, nearly two-thirds of the U.S. population lives within the 100-mile border zone, according to the American Civil Liberties Union, and it includes many major cities and several entire states, including Florida, Michigan, Maine, and Hawaii. Customs and Border Protection says the U.S. Supreme Court has affirmed the agency’s ability to ask motorists’ citizenship status, even if they have no suspicion. Here is the catch—while they are allowed to set up a checkpoint and ask questions, you are under no legal obligation to answer any of their questions. If you should drive into one of these roadblocks, Border Patrol can ask you if you’re a citizen of the United States, but, you are not required answer the question, according to the ACLU. Nor are you required to consent to any searches. Effectively, Border Patrol checkpoints have become another tactic for the ever-expanding police state to stop law-abiding U.S. citizens—who are not suspected of any type of illegal activity—and question them, while simultaneously searching their vehicles for drugs using dogs. The officer was blatantly lying, as an individual has no legal obligation to answer. Telling an innocent individual that unless they answer questions they cannot travel down an interstate, highway, or another type of road is clearly not in line with the principles this country was founded up—but par for the course in terms of how law enforcement operates in the real world. Clearly, the assumption of innocence enshrined in our founding documents is no longer applicable when law-abiding drivers are being stopped at random law enforcement checkpoints and questioned—with no legitimate basis for the stop other than to inquire about a person’s citizenship status and engage in a fishing expedition to uncover possible criminal activity. The fact that a law enforcement agency is setting up random checkpoints, over an area that contains two-thirds of all people in the country, effectively lays the groundwork for further encroachment on individuals’ civil rights and further entrenchment of an oppressive security apparatus. Someone traveling down a highway to go to work, a friend’s house, to get groceries, etc. should never have to deal with being detained by law enforcement unless there is a reasonable suspicion of criminal activity afoot.